About the Blue Ridge Parkway | Protecting the Blue Ridge Parkway in N.C. The Blue Ridge Parkway is the nation’s longest scenic parkway, stretching 469 miles and connecting Shenandoah National Park in Virginia with Great Smoky Mountains National Park in North Carolina and Tennessee. Created during the Great Depression, this national treasure spans 252 miles and 17 mountain counties in North Carolina. However, the Blue Ridge Parkway is under threat from encroaching development that could ruin the majestic vistas that make the Parkway a special draw for 15 million visitors per year. To save the Parkway as a natural, cultural and economic resource (it contributes roughly $1 billion per year to local economies and supports over 14,000 jobs), eight land conservation groups work together to preserve high priority properties along the Parkway in North Carolina. Some of these properties remain privately owned but protected forever through voluntary conservation agreements (sometimes called conservation easements). Others are conveyed to the National Park Service (NPS) for inclusion in the Parkway’s official boundary, or to other state and federal government agencies. 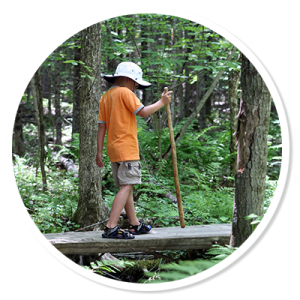 Many have trails for all to enjoy and others are permanently protected and managed by these conservation groups or dedicated private landowners. Lands along the Blue Ridge Parkway provide spectacular vistas of mature forests and rolling farmland. These areas include pristine streams, challenging hiking trails, and cultural and historic sites as well. In 1996, Governor James B. Hunt’s “Year of the Mountains” Commission recommended that steps be taken to preserve North Carolina’s section of the Blue Ridge Parkway. Since then, eight nonprofit organizations — Blue Ridge Conservancy, Conservation Trust for North Carolina, Foothills Conservancy of North Carolina, Mainspring Conservation Trust, Piedmont Land Conservancy, Southern Appalachian Highlands Conservancy, The Conservation Fund, and The Nature Conservancy — have permanently protected 64,000 acres in over 76 places. And we are protecting more each day! We encourage you to support the Blue Ridge Parkway and the land conservation groups that work tirelessly to protect it. Thank you! Land trusts are private, nonprofit conservation organizations that work with willing landowners to voluntarily protect pristine streams, forests, farms, scenic views, and places with unique natural, cultural or historic attributes. Land trusts are essential institutions that provide a foundation for healthy, vibrant, safe and diverse communities. Land trusts are constantly creating more opportunities for people to get outdoors to hike, bike, paddle, hunt, fish, and enjoy nature. Land trusts often protect natural lands with conservation agreements (also called conservation easements). These permanent agreements enable landowners to preserve their land while maintaining ownership. The agreements are purely voluntary and are tailored to meet the needs of the landowner while enabling the land trust to protect the property’s natural assets. Each agreement is different, based on the needs of the owner and the unique characteristics of the property. Conservation agreements limit the right to subdivide or develop the land, but often allow continued farming or forest management. Land trusts also protect land by acquiring properties from willing sellers or donors. The land trust may retain ownership and manage it as a preserve, or convey the property to an agency such as the National Park Service or NC State Parks for public use. The North Carolina Conservation Tax Credit was a ground- breaking public investment in protecting natural lands that provide clean drinking water, fish and wildlife habitat, thriving family farms, and recreational opportunities for North Carolina families. The income tax credit made it economically feasible for landowners to conserve their family land by donating either their property or a permanent conservation agreement (easement) limiting certain types of uses or preventing development. Unfortunately in 2013, the North Carolina General Assembly repealed the Conservation Tax Credit as part of broader tax reform legislation, eliminating a popular incentive for landowners to conserve their land. Without this tax credit the Blue Ridge Parkway is at greater risk; countless acres are susceptible to subdivision, development, and other land use changes that would undermine the natural and economic well-being of the Parkway.